ROME (CNS) — In the heart of Rome’s high-end shopping district, sparkling with Christmas lights and shiny baubles in the windows of famous designers, Pope Francis prayed that people would spend time in silence and in service as they prepare to celebrate Jesus’ birth. 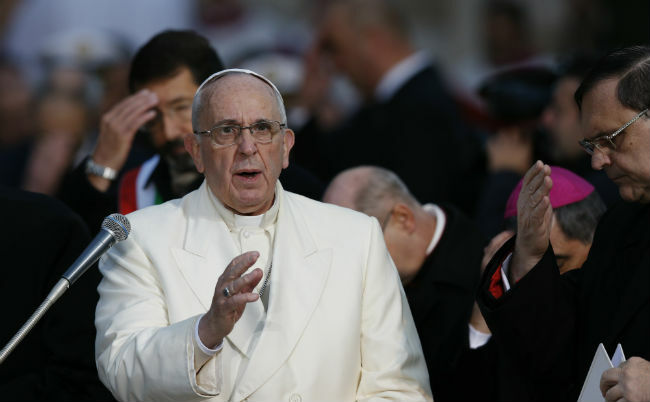 Before laying a basket of cream-colored roses at the foot of a statue of the Immaculate Conception near Rome’s Spanish Steps, Pope Francis recited a special prayer he composed for the occasion. The feast is a major Rome holiday, and with brilliant blue skies replacing days of gray and rain, thousands of people lined the streets near the Spanish Steps to catch a glimpse of the pope and pray with him for Mary’s assistance. Pope Francis said Mary being conceived without sin should give all Christians hope and strength “in the daily battle that we must conduct against the threats of evil,” because her immaculate conception is proof that evil does not have power over love. “In this struggle we are not alone, we are not orphans,” he said, because Jesus gave his mother to be our mother. In a small blue Ford Focus, the pope was driven to the Spanish Steps’ neighborhood after first stopping for a private prayer at the Basilica of St. Mary Major. Earlier in the day, with thousands of people gathered in St. Peter’s Square, Pope Francis led the recitation of the Angelus, a Marian prayer. The pope also said the Gospel story shows how Mary “is receptive, but not passive.” She agrees to God’s will, receives the power of the Holy Spirit and gives “flesh and blood” to the son of God. And while Mary was conceived without sin — a special and unique privilege — “we, too, always have been ‘blessed,’ that is loved, and therefore ‘chosen before the foundation of the world, to be holy and without blemish before him,'” as the day’s reading from Ephesians said. Recognizing how blessed they are, the pope said, Christians must be filled with gratitude and ready to share their blessings with others.